Undoubtedly one of the most famous designer duos of the 20th century, Charles & Ray Eames designed not only countless pieces of furniture, but also accessories such as the Hang It All coat rack, the Small Dot Pattern Document Pillow or the Folding Screen. The Vitra coat rack Hang It All is considered a design classic and was originally designed as a children's object, with its wooden balls painted in various striking colours and mounted on a steel wire frame, it resembles more a toy than a functional home accessory. 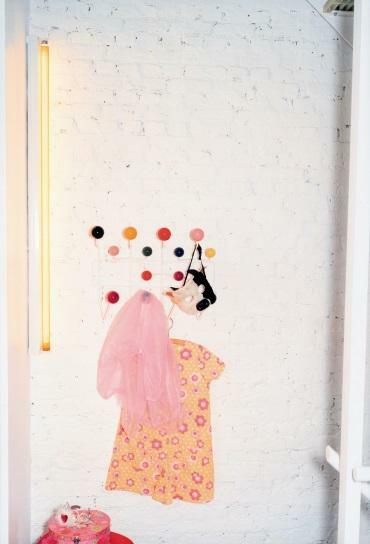 The Hang It All clothes rack can, attached to one another, become a wall wardrobe of any length. The Small Dot Pattern Document cushions date back to 1947 and are now part of a wider Vitra cushion collection, and perfectly demonstrate that Charles & Ray Eames were not focused on furniture, but also devoted themselves to the design of living space in its entirety. The pillows are made of Maharam fabric, have a hidden zip and are available in two colour versions. The Vitra Eames accessories are supplemented by the Folding Screen - a functional room divider that can be variously aligned and folded flat.